Bullfighting as an Olympic "Demonstration Sport" in Rio de Janeiro in 2016? 1. Should bullfighting be considered as a "demonstration sport" for the Summer Olympics in Rio Janiero in 2016? 2. Why? Or why not? The argument to include the bullfight in the 2016 Olympics could be made either way. Bullfighting has a cultural and historical significance but there are also other concerns such as the danger that bullfighting represents and the fact that many consider it to be cruel to the animals. In the episode of 60 minutes that we watched for this; the narrator stated that bullfighting in Spain has its origins in Minoan civilization on the Island of Crete. And indeed, much of Minoan civilization revolved around the bull. Images that have been found at sites like the palace at Knossos on Crete show figures with broad arms and shoulders with very thin waists that appear to be bound tightly. It's thought that the Minoans would do this to increase their upper body strength so that they could perform acts like leaping over bulls (this is shown in their art). So there is some evidence that the bullfight has some very deep roots in European culture, and that it's not just the Spanish that considered it to be important. I think that a compromise could be made to include the bullfight as a "demonstration sport" in the 2016 Olympics, but that there will be pressure, especially from nations outside of the tradition like the US, to not have it included in any way. For many people, unless they understand the bullfight and what it means to the cultures that they take place in, bullfighting looks barbarous and cruel to the animals. Many of the people who watch the olympics are not going to understand the bullfight if they see it on television, and If they aren't made aware of what the historic and cultural significance of it is, then there could be some potential problems especially from animal rights activists. Personally, I think that bullfighting should be allowed as a demonstration sport in the 2016 Olympics. It's an activity that carries cultural and historic importance for many people, and it provides an opportunity for the cultures that do participate in bullfighting to show and explain to other nations and people what the practice is all about. In the 60 minutes episode, the narrator talks about how people at a bullfight were moved to tears. This could be an opportunity for people to understand how and why something like that could happen. I do not think that the bullfight should be admitted into the Olympic games, but not for the normal reasons. 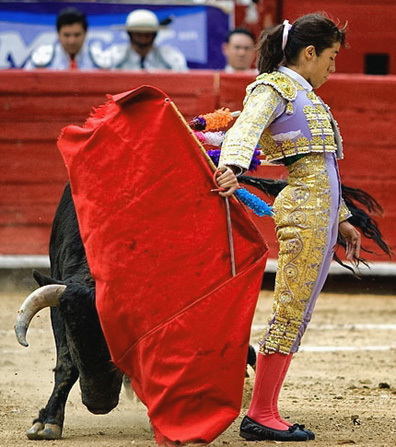 When I had the chance to visit Spain and see a bullfight live I found it to be a great exhibition of their culture if not exactly my taste in entertainment. While there issues disputed around animal cruelty and the level of danger the issue I raise is the exclusion of other sports from the Olympics in the past. Most recently baseball has been removed because of the dominance of the United States despite footings in South America, Canada, and Japan. I find the case of the bullfight to be similar. It holds more of a cultural significance than an international one. The bullfight is only practiced in Spain, Portugal, and a few Latin American nations due to Spanish and Portuguese influence. A demonstration so linked to the culture of these nations cannot be totally understood and evenly competed against when a person does not come from a place where the bullfight is common place. The Olympic games are supposed to bring the best athletes from around the world together to compete in sports which span much of the globe. While certain sports tend to have dominant or weak nations and tropical nations are at an inherent disadvantage in the winter games, I feel that the bullfight should not be added to the Olympic Games in 2016. It is only popular in a few areas of the world and is strongly opposed by both animal rights groups and those speaking for athlete safety. While the average match ends with a dead bull there is always the possibility of a dead matador. Although it would be very interesting and entertaining to watch bullfighting as a "demonstration sport" for the Summer Olympics, I believe that it is too dangerous to be seen at the Olympics. Every two years, the Winter and Summer Olympics both draw in an incredible amount of people, including people in attendance and people viewing on TV. Bullfighting began as a religious ritual, but is now a very controversial and extremely dangerous "activity." As said in the "60 Minutes" film, "bullfighting always ends in death, usually the bull but sometimes the matador," for the chance that the matador would die, I think it would be too controversial for this sport to be included in the Olympics, as millions of people would see this tragedy happen. Unlike some of the sports included in the Olympics, fighting a 1,000 pound bull can be life altering. One minor mistake could cause the matador to lose their own life, not just the Olympic competition. The Blood Brothers, Francisco Rivera Ordonez and his brother Cayetano lost their father while he was fighting bulls in the ring. Also, some countries would not have enough bulls for practice, and one event at the Summer Olympics would wipe out a lot of bulls. The immeasurable amount of bulls that would get killed and injured for the pleasure of watching this activity would upset an enormous amount of people and animal rights groups such as PETA. I believe that if Bullfighting is actually considered as a "demonstration sport" in the Olympics of 2016, it could be interesting. How many countries would actually participate in the event, or would it be to celebrate the special hobby of the Rio de Janiero peoples? It's definitely a cultural thing, but it is also dangerous. Would we internationally want to support something so dangerous? I think they should because it is embracing the local culture of where the summer Olympics will be held, but on the other hand I don't support the sport itself because of how dangerous it really is. 1. I do not think that bullfighting should be a demonstration sport for the Olympics because it involves animals. This itself can make a lot of controversy but the fact that it all ends with the bull dying makes it even worse. 2. It is a very aggressive sport that people can die in but this is true in other sports also with the crazy flips and tricks that they do. I think it would be seen differently though because of how it is done. I do not think that bullfighting should be allowed as an olympic demonstration sport. While I understand the beauty and significance of bullfighting to Spanish culture, I think the topic is just too controversial. No, I don't think it should be. I think that internationally, something like that could get a lot of people riled up. It would probably impact Rio de Janeiro's reputation negatively.